The British artist Mark Wallinger, latest winner of the Turner Prize, has installed his sensational work State Britain at the Mac/Val. This monumental installation of nearly 40 metres, is a perfect recreation of a protest display set up by the pacifist Brian Haw. The artist becomes part of heated political debates of our society, questioning the different forms of revolt. It was exhibited at the Tate Britain during the year 2007 and has been exceptionally invited by the Val-de-Marne Contemporary Art Museum from February 29 to June 22, 2008. By inviting Mark Wallinger to show one of his most emblematic works which condemns the ravages of the Iraq war, Mac/Val is faithfully pursuing one of its objectives – welcoming a debate within a museum area, showing the latest of the international art scene, echoing the collection works. Already present with the work Time and Relative Dimensions In Space, part of the collective exhibition, Stardust ou la dernière frontière (October 5, 2007 – February 3, 2008), the artist currently takes possession of the entire heart of the museum with State Britain, never-before-seen in France. State Britain is a faithful reconstitution of Brian Haw’s peace camp, an unflaggingly militant anti-war activist. 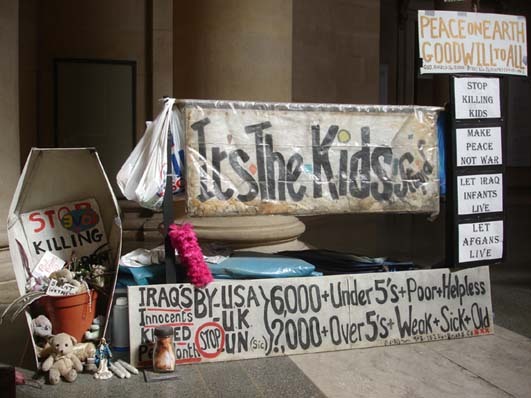 For five years he amassed banners, flags, messages, acknowledgements, pictures, and newspaper cuttings which he displayed in front of the British Parliament, to denounce the economic sanctions taken against Iraq, and the resulting involvement of the United Kingdom in the war. 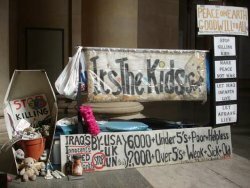 In 2005, following the adoption of a new legislation to forbid this sort of public demonstrations close to Parliament Square, the police dismantled most of his protest. Mark Wallinger witnessed the whole polemic and consequently was able to rebuild the entire peace camp at the Tate Britain. Using photographs taken at the time, the artist created a meticulous copy of all the documents collected by Brain Haw, therefore becoming a continuation of the latter’s controversial stance. By procuring this prestigious museum space, Mark Wallinger dislodges the debate, exerting a powerful artistic caress, and notably questions the power that symbolizes resistance or loss of individual freedoms …. His subversive action lets him interrogate the role of artists from a political standpoint, or even the status of works of art . Following the example of Rikrit Tirvanija who was able to recreate the Peace Tower of Mark di Suvero in 1965, Wallinger belongs to a long line of artists participating in a debate which fuels political art. What consequences can a political issue have on art production? 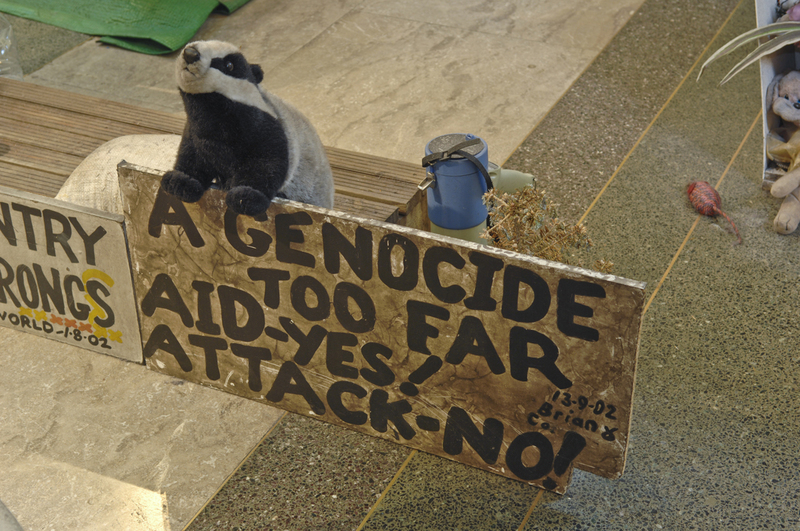 The originality of Mark Wallinger‘s installation State Britain is to refer to a political situation without really restricting the universal scope of his protest action. Mac/Val’s invitation also gives this work of art a new resonance in another political context.